Zumba is an amazingly fun and energetic way to get in shape. People young and old have found Zumba a great way to engage in cardio while doing something as fun as dancing. But dancing requires a different kind of movement than regular cardio workouts such as running. For this reason, many Zumba dancers have taken to finding the best Zumba shoes to ensure the best comfort and utility necessary for a Zumba class. There are many Zumba shoes out there, but there are only a few of the best ones. 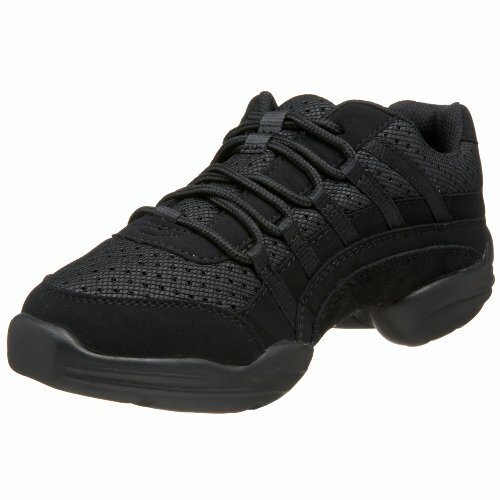 Today, I would like to share with you those top picks for Zumba sneakers to help you get on the dance floor. Is It Necessary To Get Special Shoes for Zumba Class? Some people are opposed to the idea of having to buy a whole new pair of shoes for something like a fitness class. But after taking their first few classes of Zumba, many people realize the problems that can occur from not having the correct type of shoes. Many people wear running shoes or sneakers for their first Zumba class. They quickly run into problems with turning smoothly and not enough lateral support. Zumba consists of many movements side-to-side as well as forward and back. There are also spinning and turns involved. The traction on regular running shoes or sneakers is great for walking and running outside on slippery terrain. The traction becomes a nuisance in a dance class where you should be able to freely move and spin around. The traction makes you stick to the floor and causes your knee joints to twist unnaturally causing pain and discomfort, not to mention long-term damage. Once realizing this, many people who do Zumba regularly opt for a different type of shoe. They look for a shoe that allows for some turning without too much slippage. Shoes with good lateral support are better for Zumba classes as well as Zumba consists of many Latin-style dance moves which contain many side-to-side movements. Many Zumba instructors and enthusiasts say that the key to maximizing your workout is precision and intensity level. You are better able to do this by having the correct shoes. RYKA was founded in 1987 by Sheri Poe who wanted to create a better-fitting athletic shoe for women. She considered the different anatomical features of women’s feet compared to men and applied them to a new kind of shoe. This resulted in a narrower heel, roomier forefoot, and increased instep volume. RYKA sneakers are well liked for their lightness, pivot points, and breathable mesh. 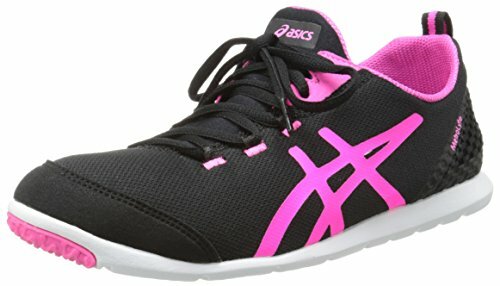 ASICS is a popular athletic footwear company founded in 1949 by Kihachiro Onitsuka. ASICS prides itself on creating the best quality shoes backed by sound scientific research. They have a Research Institute of Sports Science in Kobe complete with research facilities and gyms to test their shoes. They’re best known for their features in shock-absorption, pronation prevention, and outsoles with Wet Grip Rubber. Bloch is a shoe company originally focused on dance shoes. They began making pointe shoes, then branched out to dance sneakers, jazz shoes, tap shoes, and, now, even make dancewear. Since this company was founded around creating quality dance shoes, many people love purchasing Bloch shoes, especially their dance sneakers, for their Zumba classes. The company that created the Zumba movement created their own shoes for their avid Zumba enthusiasts. They understood that Zumba requires a different kind of shoe that allows for certain kinds of movement achievable with regular running shoes. They are made lightweight and with their Z-slide feature that makes for easy sliding and turning on the floor. Finding shoes for your particular pair of feet can be difficult and overwhelming at times with the vast shoe selection available. Here, you will find shoes that are made for those with foot problems, those with strong feet, narrow and wide, those with more support than others, and color variety. Keep in mind the kind of shoe that works best for your foot and take note of the shoes that sound like they could be a perfect match for you. 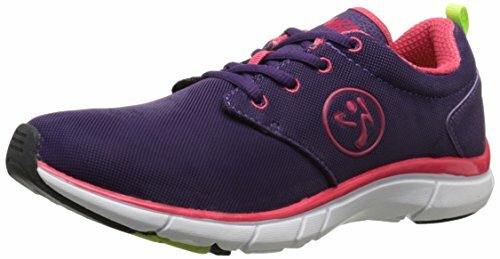 The best Zumba shoes for women are the RYKA Women’s Influences. The Influence is a colorful lace-up shoe that comes in a variety of colors and offers great features for those who do Zumba regularly. The precise-return bouncy insole offers great cushioning and makes for the great support for executing the bouncy movements frequently performed in Zumba. The dual-impact midsole helps absorb shock, and the traction outsole footprint design offers pivot points on the balls of the feet for easy turning. The synthetic and mesh upper includes flex-foil and direct-fuse support layers that help offer great lateral support. 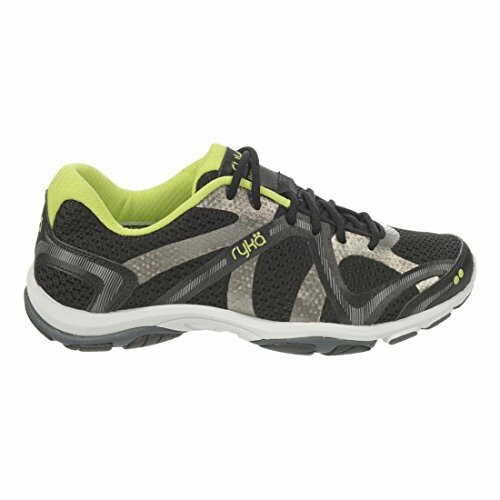 RYKA made these shoes with N-Gage EVA energy return to provide shape retention and cushioning the impact. Many people rave about the arch support and the roomy toe-box in these shoes. Others say the shoe is not well-suited for those with wide feet. I would recommend trying these shoes on in-store to ensure proper fitting. The RYKA Influence’s can be found in Zumba classes everywhere because they are so well-liked and comfortable. It gives the perfect amount of support without feeling constricting, enough flexibility without straining your feet, and, as an added plus, they’re super cute! Second up, we have the ASICS GEL-Fit Sana which offers support in a lightweight trainer. They’re pretty shoes that come in many colors. Those who do Zumba love wearing these for their minimalist look and feathery lightness. Many users will find that these shoes fit like a glove. This has to do with the design. A stretchable MONO-SOCK fit system connects the tongue of the shoe to the collar creating a slip-on style shoe. The upper is nice and stretchy allowing plenty of room to insert your foot. A rear-foot gel-cushioning insole makes for a comfortable step. AHAR and high-abrasion outsole offers shock absorption. A soft mesh lines the upper allowing for plenty of air circulation and subsequent foot comfort. There’s even an easy-access rear loop hole which you can use to pull the shoes on easily. Convenience is a key feature of these shoes. Many people will even wear Sana’s without socks! They’re that comfortable. As you can see with the minimalist style, though, they don’t provide the greatest support. Therefore, these are not highly recommended for those with poor arches or foot problems like plantar fasciitis. Besides being super comfortable to wear in Zumba class, many people will find themselves wearing these out with friends, to the movies, or on errands. They’re so cute and comfortable, they’re some of the most versatile shoes you could own. It is expected that a shoe from the brand of Zumba would make it to the top of this list of best Zumba dancing shoes, so here it is: The Zumba Fly Print Dance Shoe. The creators of the great Zumba style have thought through all the necessary features needed to excel in their Zumba classes. The Fly Print is made with a soft breathable mesh which gives that important ventilation for the feet as well as a flexible, comfortable fit. The outsole is made with their signature Z-slide feature. This allows you to slide easily on any surface. Like the ASICS GEL-Fit Sana’s, these shoes are also made with the tongue integrated. These shoes fit like a slip-on, hugging your feet in a comfortable manner. Lightweight cushioning on the insole provides great support during your workout. Many people like the Fly Print because of the wide toe box and arch support. These features make the Fly Print Dance Shoes great options for those with wide feet and foot ailments like bunions. They come in a variety of cute color options. Since they came from the Zumba brand, the fun prints are meant to stand out in a class that is already high-energy. You’ll feel right at home in a Zumba class wearing Fly Prints. Get a glove-like fit with all the fixings for a smooth and comfortable ride with the ASICS Metrolyte! ASICS is back to wow us with another stellar shoe for Zumba: The MetroLyte Walking Shoe. 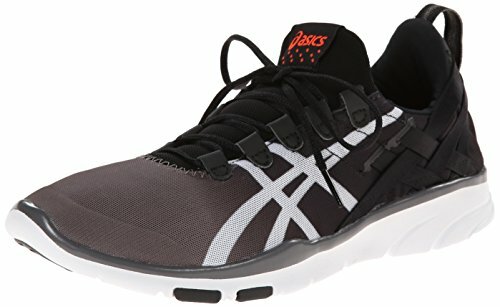 Although the name of the shoe includes “walking”, these shoes are great for Zumba classes due to their light weight comfort, and great overall design. This shoe is made with a similar design as the GEL-fit Sana but with some added features that may make this a better fit for those who need more support. The upper is made thicker and with mesh overlays for added stability. This is great for lateral movement. Inside the shoe, there is a memory foam sock liner. Every step and dance move you make feels like stepping on clouds. ASICS also added their ComforDry Sockliner that provides added cushioning performance and moisture wicking. This makes for cooler, less sweaty feet. These shoes also have the heel tab at the back for easy slip-on making these shoes very convenient when you’re rushing out the door. They come in many cute colors as well; many people buy multiple pairs! Again, since this is a minimalist shoe, they may not offer enough support for some people. Many find that these are also too narrow for their feet. The best way to find out is by trying them on before purchasing! Wrapping up our top 5 Zumba shoes is the Skechers Sport D’Lites Memory Foam Lace-up Sneaker. These shoes are made with a more intricate design pattern and much more support compared to previous models mentioned so far. Those who want and need more support will want to take note of these shoes. 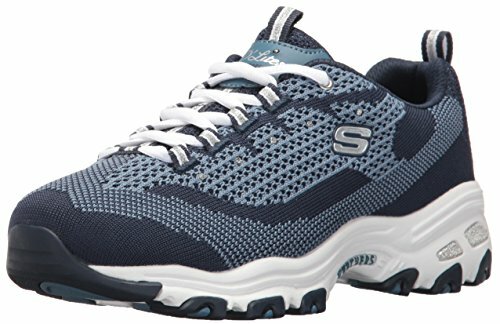 Skechers is known for making supportive quality shoes with longevity in mind. The D’Lites are no exception. A lace-up vamp offers centralized support and a cushioned thick midsole makes for a perfectly shock-absorbed step. The insole is made with memory foam for a soft step inside of the shoe. The padded tongue and collar makes for a soft fit around the ankle. The D’Lites also have a two-tone heel pull strap for easy on and off. For all of its support and cushioning, these shoes remain lightweight. The only downside to these shoes is that they don’t breathe very well. The upper is not made with a mesh or ventilated system, so you may want to wear thin socks with these. They come in many different styles and colors. Many people who wear these shoes find that they receive many compliments on them! They are also versatile and can be used out and about or even on short hikes. 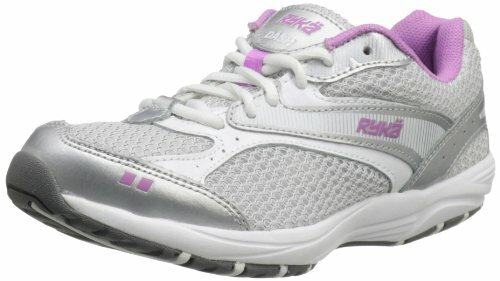 RYKA’s Dash Walking shoe is available in neutral colors of brown, black, blue, and white. If you’re looking for more color options, this may not be your first choice. Many women enjoy these shoes for their support. The Dash Walking Shoes are made with a breathable mesh upper with supportive overlays. This creates stability as you move laterally as well as allows ventilation through the shoe so your feet don’t suffocate. The upper is also made with high-density foam for comfort and durability. Unlike other shoes, these ones come with a reinforced toe for added protection. Women with wider feet will enjoy the width offered in the toe box of these shoes. The support in the midsole and insole makes these good for people with flat feet or foot pain. A padded tongue and collar top it all off for a comfortable shoe on the Zumba dance floor. Perhaps they could offer more interesting colors, but we’ll take what we can get. Bloch gives us our first split-sole dance sneaker of the list in the Evolution Dance Sneaker. These are some of the best shoes for Zumba workout. The non-marking rubber outsole is made with a medial pivot point for easy turning. The dynamic mid-foot stretch mesh allows for decent arch support. The upper is made with a combination of leather and mesh to allow for durability and breathability. A high-density foam lines the collar of the heel for added comfort. There is a removable contoured compression molded sock liner on the inside as well that makes for a comfortable step. These best sneakers for Zumba are some of the lightest shoes you could wear. This is why Zumba enthusiasts and instructors love them so much. As an added bonus, the slider on the laces holds your ties in place so they don’t loosen while you dance. Like Skechers, New Balance is also known for creating some of the best supportive quality shoes available on the market. I’m happy that they have a shoe that made the Zumba list. 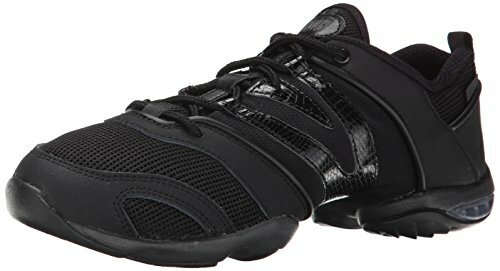 The WX608V4 Training shoe is one of the most supportive shoes you can buy for Zumba. A supportive internal shank and New Balance’s shock-absorbing Abzorb technology makes for a responsive insole within the shoe. The IMEVA midsole helps to provide great arch and heel support. New Balance is well known for making shoes for those of us with wide feet. These shoes are no exception. This feature along with the stability features of the arch and heel support makes these shoes great for flat, wide feet and people with foot ailments. These shoes come in a simple design in mostly neutral colors. They also offer purple if you’d like something a little brighter. If you need more support, New Balance is the way to go. Synthetic and breathable mesh. Direct-Fuse and Flex Foil materials provide support while velcro strap over midfoot gives her a secure fit. Rubber outsole with pivot design offers traction and allows for easy transitions from one dance move to the next. If you thought you didn’t have enough options from RYKA, here they are again with their Tenacity Dance Training Sneaker. This shoe stands out from the rest with its high-top silhouette with metallic stripes and adjustable hook-and-loop strap. The high-top design is meant to add more stability in the ankle. The lightweight full-length upper has additional ankle support and a mid-foot strap for secure fit. The padded tongue and collar make for a nice wrap-around the foot. The low-profile platform features an N-gauge EVA foam under the forefoot to provide extra cushioning. 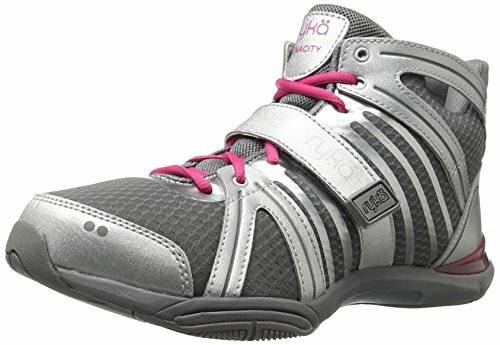 These are some of the most comfortable Zumba tennis shoes you could find. Precise-return insole provides extra cushioning and movement feedback. The IHG molded heel reinforcement adds support. The traction outsole has- you guessed it- that ever-important pivot-point design. The funky style is a great addition to any Zumba enthusiasts’ wardrobe. Word of caution: some users may find that these run a tad large. Completing the list with one last best dance sneaker is Capezio’s Rockit Dance Sneaker. Like the Bloch Evolution, these are split-sole dance shoes. The perforated arch gives ventilation and flexibility through the foot. The non-marking PU outsole is made with built-in patented flex points to make for better movement. A forepart spin spot allows you to turn and spin freely. Some wearers have found that perhaps it is too slippery on wooden floors; something to keep in mind. The imitation suede upper is combined with a lightweight and breathable strong foam rubber nylex mesh. A padded Achilles notch adds comfort. There is even a flat, boxed toe for toe stands. The footbed is contoured and cushioned, and able to be removed and replaced if necessary. It may be necessary to order a half size larger than normal, but again, this can only be determined by trying a pair on. If you like having more freedom in the feet while you dance, you may like these dance sneakers for Zumba from Capezio. By now, you probably have a good idea of what you should be looking for when purchasing yourself some Zumba shoes. But just in case you need a reminder, here are some of the most important things to consider when making that special purchase. Grip. Most running shoes are made with excellent traction. This is meant to prevent slipping on different types of terrain, whether it be outside or on a treadmill. This is a great feature for running, but not so great for something like Zumba. Zumba includes many dance moves where you’ll want to be able to move and slide freely across the floor. This doesn’t mean that you’ll want to get rid of traction completely; traction on the bottom of shoes will help stabilize your movements. You’ll want to find something with a happy medium. Some of the best shoes for Zumba offer traction throughout the outsole and, a feature I’ll talk about next, the spin spot. Spin Spot. A spin spot or pivot point is usually placed on the ball section of the outsole of each shoe. This means easy turning and spins. Zumba enthusiasts love this feature on shoes. Your knee joints will not be twisting unnaturally causing strain, so it’s a protective feature. You also won’t find yourself stuck to the floor during turns, subsequently slowing down your movement and forcing you to catch up. Pivot points allow you to protect your joints as well as keep time to the music. Shock Absorption. Zumba dancing consists of a lot of jumping, hopping, and weight transfer. For this reason, you’ll want to find shoes that have good shock absorption. Like the spin spot, shoes with good shock absorption will help save your legs from long-term damage and lower the impact on your body. You want to get a good intense workout from Zumba, but not at the expense of healthy joints and ligaments. Lightweight. Since Zumba is a fast-paced cardio dance workout, you’ll want to be light on your feet. Heavy shoes will weigh you down and slow you down. It’ll also make the workout more difficult. A nice lightweight shoe is the best bet for Zumba class. It’s ideal to almost feel like there are nothing on your feet. This is why many people opt for shoes that fit around their feet like gloves. Ventilation. Any high cardio workout will have you sweating. This includes your feet, so you’ll want to make sure the shoes have some ventilation. Shoes with mesh or perforated overlay will allow the shoes to breathe and prevent your feet from suffocating. This will help minimize discomfort while you dance. Support vs. Flexibility. This feature is more of a personal preference and should be based on your foot type. Everyone should want to find a good balance between supportiveness and flexibility. Since there are a lot of lateral movements and rolling through the feet, you’ll want to have shoes that aren’t stiff or constricting. How flexible you want it is up to you. For maximum flexibility, dance sneakers are a great way to go. For more support, you’ll want to consider shoes like New Balance or Skechers. Having the right shoes for Zumba can be a real game changer. It can make you more confident, efficient, and effective in your workouts. It’ll definitely make it even more fun to workout. Take the Zumba world by storm in your new Zumba shoes. 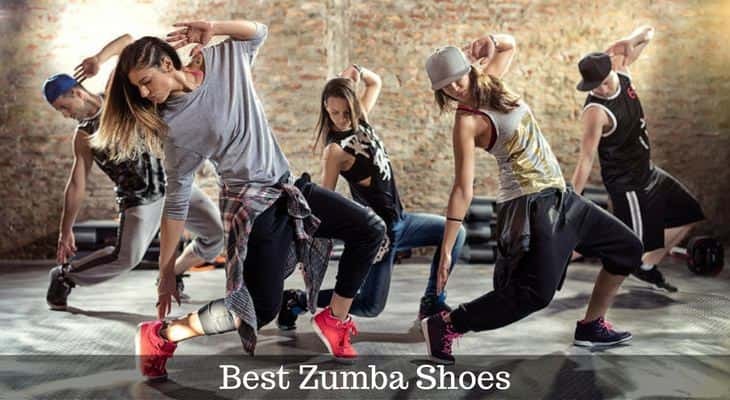 Share with friends and family who are also Zumba enthusiasts the importance of having best Zumba shoes, and share this list with them so that they can begin having as much fun as you are in your Zumba class. Who knew a pair of shoes could change your life!